iNetBet Casino is all about simplicity. From its sleek and beautifully-designed website to its easy-to-use software suite, everything is highly polished and looks just plain great. They offer a stout selection of games, including 7 varieties of blackjack, great promos and bonuses, and an established comps system. It is highly recommended site for new players, because they actually let you lower your minimum bet to just $1, so you can enjoy the thrill of playing for real money without risking too much! 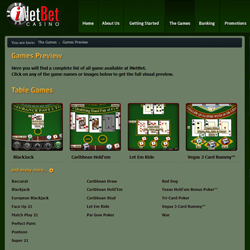 iNetBet Casino offers gaming via downloadable software suite as well as instant play for easy access. Most players prefer the in-browser experience but the software deserves a mention for being crisp, clean, and professional-looking. The games are powered by RTG so you can expect great gameplay and beautiful design. 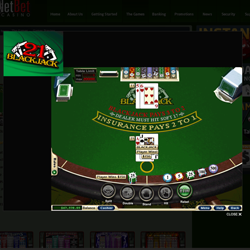 In addition to offering a great-looking standard blackjack game, iNetBet Casino provides six other variants: Face Up 21, European Blackjack, Match Play 21, Perfect Pairs, Super 21, and Let Em Ride. Each has its own slightly different rules set, so you can have fun experimenting. Some even provide different ways to win. There are enough blackjack varieties here to keep you busy for a while so have a go by visiting InetBet Casino! 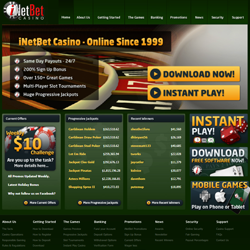 Offering hundreds of different games, iNetBet Casino offers great variety. All the games are exceptionally well presented, and even the multi-line slots have a classy look to them. Players have access to the usual arsenal of games – lots of slots and progressives, table and card games, plus bingo, keno, video poker, and more. No arcade games show up in the list though – you’ll have to go to a different site for those – but serious players won’t miss them. Whatever the case, you will find lots of interesting games to play here. Signing up at iNetBet Casino is a good idea, not only because you’ll have instant access to a world-class and long standing internet casino, but also because they give you a 50% bonus on your first deposit, up to $500. If you’re interested only in slots, you can claim the slots bonus, which was set at 100% up to $200. The Free New Player bonus is $10. The playthrough is 15x and you can cash out $50. Once you are in, you can look forward to being part of one of the net’s premiere comps programs. It is unique because the longer you keep your comps points, and the more you cash out at once, the more you get for your points! If you stay in the game for a while, it can really pay off. 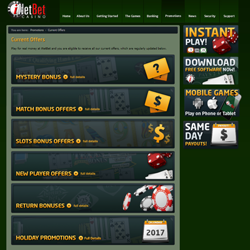 iNetBet Casino has a lot of good selling points, and we focused on the presentation and look of the site. This might not be an important factor for some, but for those who are concerned with how a site and software suite look, this casino will offer a welcome change. If it makes no difference to you, we suggest trying out iNetBet Casino anyway, because it scored well in all of our categories, and is a solid casino overall. It’s a decent site for blackjack, especially if it’s not the only game you place, since they offer relatively few variations of the game.